wow did stack exchange change their beta test themes? Interesting, why not outdoors or sports then? @Kevin because it hadn't been beta-tested enough yet? It's really nice, this theme. Yes, I like it better too. Regarding edits, what's the usual protocol for editing in very early stages of sites? Seeing that it will take a bit for a reasonable group of users to reach 500rep ( meta.stackoverflow.com/questions/74463/… ), all questions will remain uneditable until that point. @Gilles: Well, that makes sense. However, temporary mods (e.g. 5 users with the most overall-SE rep) would make sense nonetheless. And we now have MathJax. Q: Request for LaTeX notation? I think this website needs LaTeX notation, and I'm guessing I'm not the only one with this feeling. 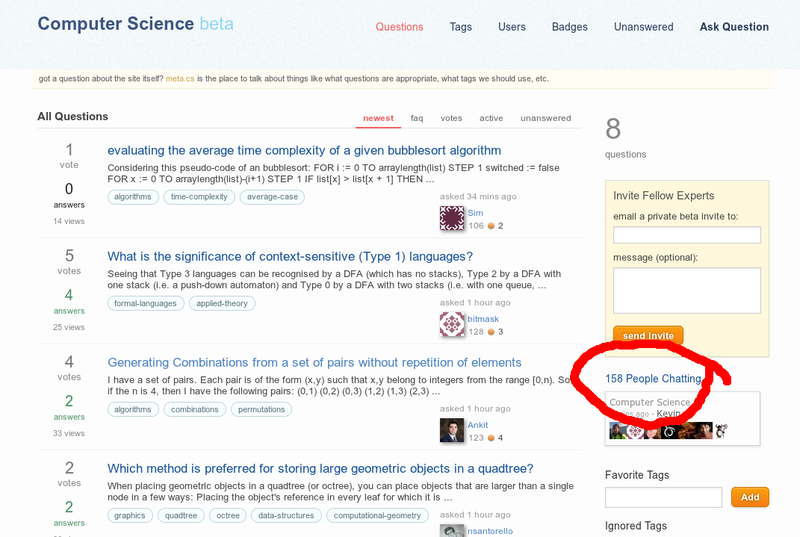 How can we ask StackExchange for that feature? @bitmask We'll get mods pro tem in a few weeks. there's a blog post on its way out the door. was supposed to have already been out, but it'll be out soon. I wanted to give you a quick look at the new Stack Exchange Beta theme. Yes, we are retiring the familiar “Sketchy” theme and rolling out a more-polished and finished design for the beta sites. Over the course of the next few weeks, we will be rolling out the new Stack Exchange Beta theme to all the sites still in beta. That's a bit unfortunate. I always thought that beta sites should look a bit ugly and sketchy. Why does the little box on the sidebar say we have 153 people chatting when we only have 85 users? @Kevin: There are other rooms, with 159 users currently talking in 53 rooms. It appears it is the total over chat.SE. I think it's somewhat misleading. @Kevin: I see. Well on this page (see right) it is a bit more verbose. My sidebar here doesn't have it, I think I'm in too many rooms for it to show.